Show, don’t tell. It’s one of filmmaking’s oldest adages—write for the screen. Don’t drag out in dialogue what’s better served through action, left unsaid, sequestered away in subtext. I bring it up because Fullbright’s first game, Gone Home, was a master of subtext. Arriving at your family’s empty house in the middle of the night, you’re left wandering room to room, piecing together a story from the objects you find scattered about. An invoice, a rejection letter from a publisher, a milk carton, a scribbled drawing, an old newspaper clipping—Gone Home worked in subtleties, a family dynamic reduced to its material possessions. Not for the last time, I’ll preface a largely critical review by saying “I enjoyed it.” I did. I enjoyed Tacoma. I’m a sucker for space games, really. Especially ones that are well thought-out. Event, Prey, Tacoma—they all share a Kubrickian fetishization of detail, nods to both classic science fiction and hard science. In Tacoma this manifests, like Gone Home, in spectacularly detailed objects. The titular space station Tacoma is meant to be lived in, so how did the people there live? And the answer, it seems, is much like us. The future is shiny and chrome, but people still run on treadmills, litter their workspaces with Post-It notes, and leave food wrappers everywhere. It’s just that these food wrappers belong to calorie-packed meal replacement bars, not [Insert Popular 1990’s Candy Bar Here]. It’s a meticulously detailed depiction of the future. As I made my way through Tacoma, I often felt like I was exploring a digital Epcot, a glimpse of the hallowed “World of the Future” built for 2017. It’s not just that Tacoma is thorough—it’s also so mundane. It focuses on the small technologies, on the reality of humans living in space once “Being In Space” isn’t so exciting anymore. 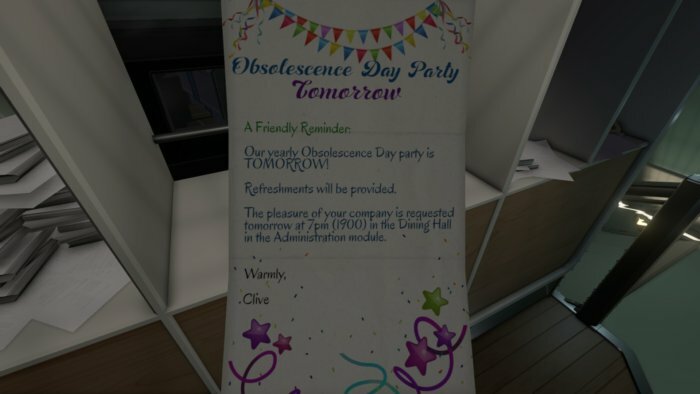 But where objects were the be-all-end-all of Gone Home, Tacoma’s objects are incidental. They give the world weight, act as set-dressing, but they’re not the story. Few objects in any room can actually be picked up and examined, and even fewer factor into the bigger picture. You’re rarely making the same sort of archaeological inferences made in Gone Home. Instead, Tacoma tells its story through holograms. Like Gone Home, you arrive at Tacoma post-hoc.The crew is gone, the station abandoned. The spirit of the crew remains, though. Every moment, every interaction aboard Tacoma has been recorded. Privacy concerns aside, it’s your lucky break—you’ll use these recordings to recreate the events on Tacoma, figure out what went wrong. Some recordings inhabit a single room, others an entire common area, and they play back in 3D space—conversations, movements, it’s all recorded in these color-coded holograms, ready for you to watch, pause, and rewind at will. That last one’s basically mandatory, too. 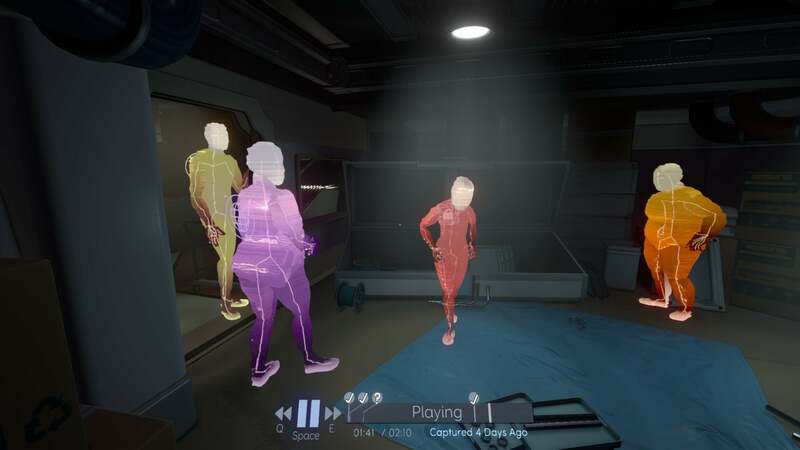 There are six crew members aboard Tacoma, often split between different rooms in a given hologram, sometimes converging and then parting again as the playback continues. To get the full story you’ll usually watch a scene from one person’s perspective, rewind, then watch another viewpoint, and so on. 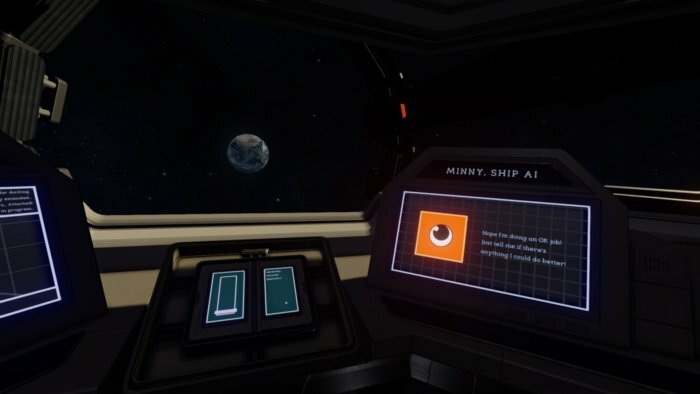 At certain points you’ll also be able to access the crew’s augmented reality displays too—basically floating computer screens, filled with notes or chat messages. 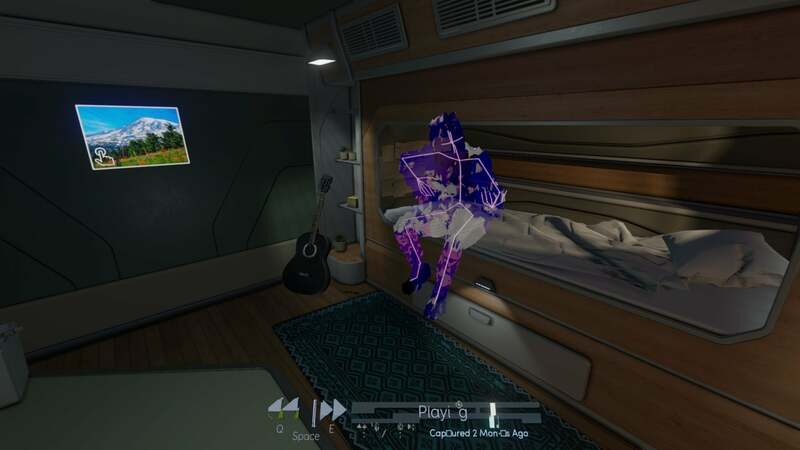 It’s more the equivalent of Gone Home’s objects than the actual objects on Tacoma. Adding to the confusion: The scenes aren’t in chronological order. In the lounge for instance you might see a scene from five days earlier, shortly before your arrival. Enter the nearby captain’s quarters though and you’re treated to a recording of the captain playing guitar months earlier. Nor are the notes on the crew’s AR displays guaranteed to be related directly to the matter at hand. A throwaway note in an early scene might provide a key insight later on, as you find out what it relates to. That Tacoma succeeds in telling this sort of non-linear story is impressive. You should, provided you take your time and watch every person’s actions in every scene, come away from Tacoma with a full understanding of what befell the crew, as well as some insight on the various personal stories. Back to “Show, don’t tell” though. Tacoma’s holograms, albeit novel, are just very elaborate cutscenes. Cutscenes you can keep half an eye on while simultaneously reading the packaging on a cup of Space Ramen or whatever, but cutscenes nevertheless. Maybe even audio logs, if you’re feeling less charitable—rarely do the colorful humanoids in each scene do anything interesting. You mostly follow them room to room as they walk-and-talk, sometimes staring out a window or doing menial jobs. One scene, you’re just trapped in a space gym devoid of interesting objects while a guy pedals on a stationary bike, talking to his son on a future-phone for three or four minutes. Three or four minutes. The conversation ends up being important in the context of Tacoma’s frame story, but it doesn’t feel like a meaningful interaction for the player. You just stand there, maybe get annoyed and punch the nearby punching bag while you kill time. The ability to pause or rewind this guy’s looooong conversation doesn’t add anything that a normal cutscene couldn’t accomplish. 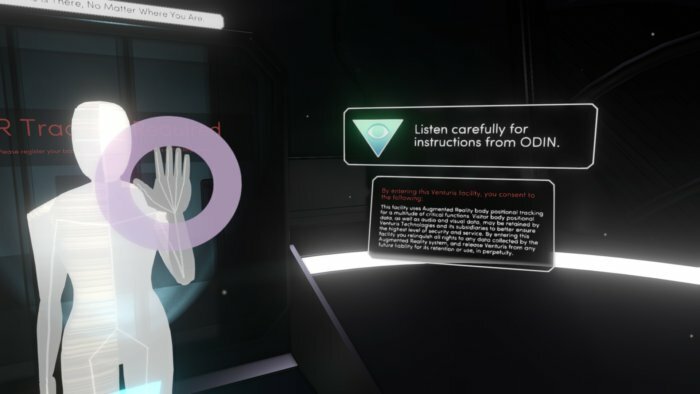 Compared to the pseudo-detective feel of Gone Home, Tacoma’s gimmick just isn’t all that interesting. Novel? Definitely. Well-implemented? Sure. But there’s just not much to hook the player. It doesn’t help that the game is so short. I’m not one of the people mad about Tacoma’s length versus its price. It’s $20 for 3-4 hours of exploration, which is in line with Gone Home, and you can make your own value judgment. It’s not an argument I’m interested in. But as far as it relates to the content? With so much weight on Tacoma’s characters, it’s a shame those characters don’t really go anywhere. There’s no real development, no indication of how these characters change when faced with crisis, nothing much interesting about them. They sometimes feel as lightly detailed as their monochromatic 3D figures. There’s not enough time to feel much of anything for these characters before it’s over. Tacoma’s one of the rare games I think would benefit from being twice as long and twice as dense—though maybe its gimmick would grow old before it reached that point. Hard to say. As I said up front, I enjoyed it. Tacoma is a pleasant and brisk experience with a stunning eye for industrial design. It lacks the subtlety of Gone Home though, and in the process misses much of what made traipsing through the Greenbriar family home interesting. 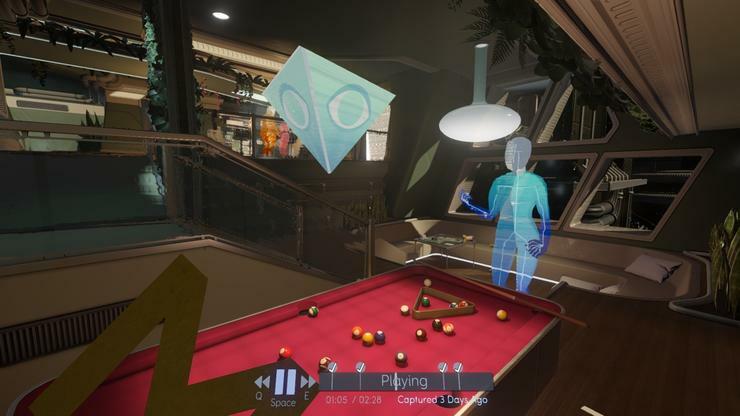 Fullbright succeeded in depicting the future, in making Tacoma feel lived in. Now if only the people who lived there were more interesting.